I stamped with silver to match the silver accessories that I chose to wear with my dress. The stamping was done using Pure Ice Silver Mercedes and the new Mash plate Mash-46. 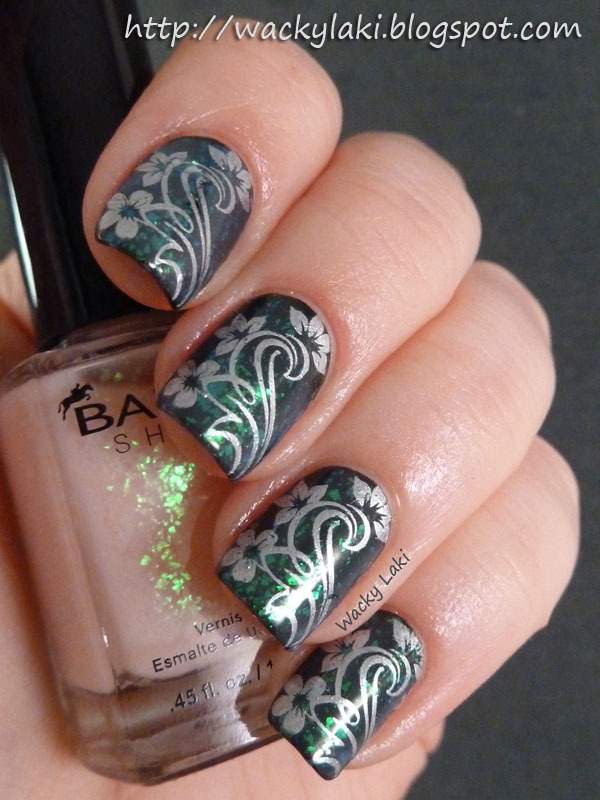 Just to mention, Silver Mercedes is my new favorite silver stamping polish. It has blown all previous competition out of the water and I wouldn't reach for anything else at this point. Wow this looks amazing! Beautifully done! So pretty! Love the mani and the title haha. I would love to see how you reverse the image. These came out awesome! I love the green combo you came up with and the stamping looks impeccable. You are making me want those plates that's for sure! I really love your mani! It's fabulous! Absolutely beautiful. I've never stamped. Looks so complicated but now i am inspired to try it. This is so pretty! I've only just begun stamping and have had no success (yet). I can't even cover an entire nail! LOL Seeing this makes me want to try again! beautiful from start to finish!!! Sorry, I am DAYS behind in my posts reading-have gotten down to 480 from 1000+!! This is gorgeous! It looks a lot more complicated than it really is so I encourage all to try it and keep trying (to those who said you are new to stamping).